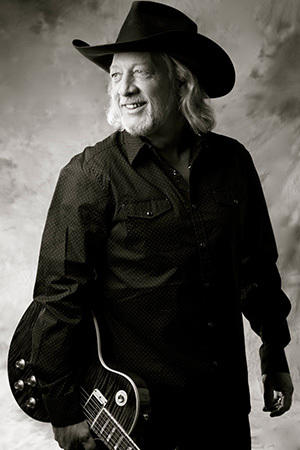 To put it simply, John Anderson is one of the greatest country music singers to ever step up to the microphone, possessing one of the most instantly recognizable vocal instruments in the history of the genre. Anderson moved to Nashville in 1972, working contruction by day (including as a roofer at the Grand Ole Opry House) and playing the honky-tonks at night. He signed to Warner Bros. in 1977, and notching his first major hit in 1980 with Billy Jo Shaver's "I'm Just an Old Chunk of Coal (But I'm Gonna Be a Diamond Someday)." Other hits, including the classic "Wild and Blue" in 1982, solidified his status as a powerful new voice in country music. "Swingin'," written by Anderson and Lionel Delmore, blew the roof off a year later, exploding to No.1 on the Billboard Country chart, propelling Anderson to the CMA Horizon Award, and becoming one of the most enduring hits in the country canon. Anderson plowed through the ebbs and flows of country music (and the country music business) throughout the '80s, and in the early 1990s engineered one of the greatest "comeback" runs (he never really left) in the history of the genre. Seminole Wind, released on BNA, produced hit singles in "Straight Tequila Night," "When It Comes To You," "Money in the Bank," and the stirring title cut. The latter would have never been released had Anderson not stuck to his guns, a familiar refrain throughout his career as the artist has wound his way through virtually all of Nashville's major labels. No such clashed occurred in creating Goldmine, an album cut with the artist in complete control. Produced by Anderson with longtime collaborator Joe Spivey, Goldmine is an artist achievement, recorded the way the singer intended. "With Goldmine, I thought, first off, I'm going to take my songs into the studio and make a record like I think it ought to be made, without all those other influences," he says. "I really don't need a lot of help to make a John Anderson record, and this record pretty much proces that. In fact, I'm more pleased with the sound of this record than I have been in a long time. It's easy to see why. Goldmine has generous helpings of everything John Anderson does well and he does a lot of things very well. The record has it all: a swampy cautionary anthem in the crowd-rousing "Freedom Isn't Free," rollicking mid-tempos like the roadhouse boogie (and Merle Haggard-penned) "Magic Mama," "I Work A Lot Better," and the hook-laden title cut. Deeply moving ballads in the traditional country style in "Back Home," and "I Will Cross O'er the River." And an abundance of romance in the haunting "Happily Ever After," and, in contemplative tribute to fans, "You All Are Beautiful." Then ther are the indefinable, compelling set pieces that only John Anderson could deliever. "Louisiana Son of a Beast," with its swagger, swamp cats and wild hogs, is an exercise in backwoods mythology. "Holdin' On" is a regret-drenched ballad in the vein of "I just Came Home to Count the Memories." The wistful "On and On and On...," builds a panoramic musical soundscape. Beyond the inspired vocals and ambitions songwriting (Anderson was inducted to the Nashville Songwriters Hall of Fame on Oct. 5, 2014), the singer credits his handpicked studio musicians with the tasteful authenticity of Goldmine, which boasts a musicality light years from the over-produced bombast frequently found on contemporary country airwaves. “It’s all about knowing the right guys to call, and most all of the guys that played on this record are old friends, aside from being great musicians,” Anderson says, adding that he’s not keen on having the studio players take their cues from demos or scratch vocals. Instead, Anderson plays the song live in the studio and lets the pickers do what they do.